Steve Saunders Goldwing Forums > Forums > Events > RTE - Moore Fish Farm will be open this coming weekend the 19th & 20th. Moore's Fish Farm is at Moore's Fish Farm. Dinner Giveaway!! We will be open this coming weekend the 19th & 20th. We will give away a set of dinners for every 100 comments so be sure to share! To enter comment "April Fish Fry" in the comments section below. We will be open from 4pm-9pm both nights. We will pick winners at noon on Thursday! Adult price is $14.00 + tax, kids 6-12 $5.00 + tax, kids 5 & under eat free. It's an all-you-can-eat buffet that has Fried Catfish, BBQ Pork Shoulder, BBQ Sausage & Bologna, Beans & Cornbread, Mashed Potatoes & Gravy, Corn, Homemade Potato Salad & Cole Slaw, Fries & Hushpuppies, Homemade Tartar and Cocktail Sauce, and lots of desserts! 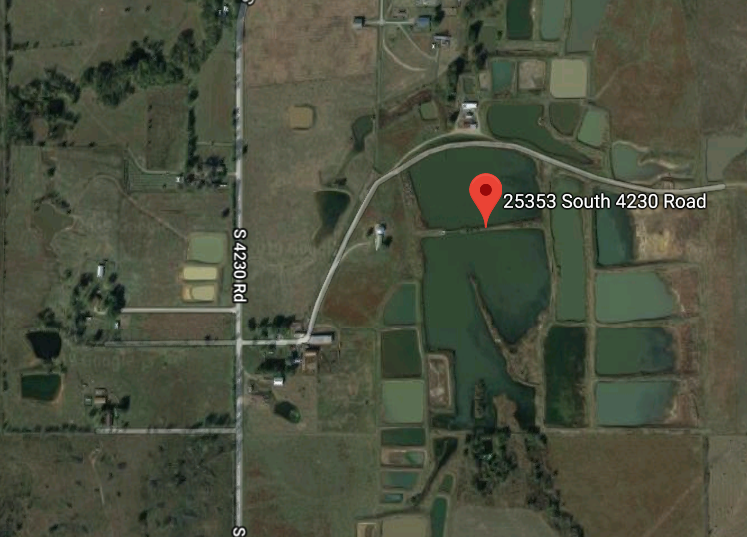 We are located at 25353 S 4230 Road in Inola! the GPS is wrong, the gate is 1/2 mile south of this address. you look for a big silver Silo on the north end of a barn. Looking for Fish this Spring? See our 2019 Price List and contact us with any questions! We also have home grown ground beef available for $5.00 per pound. Pick up at farm or the restaurant this weekend! I just love their Catfish, we are going, someone want to tag along with us? What day are you guys going?? I need to check to what I'm committed to already. 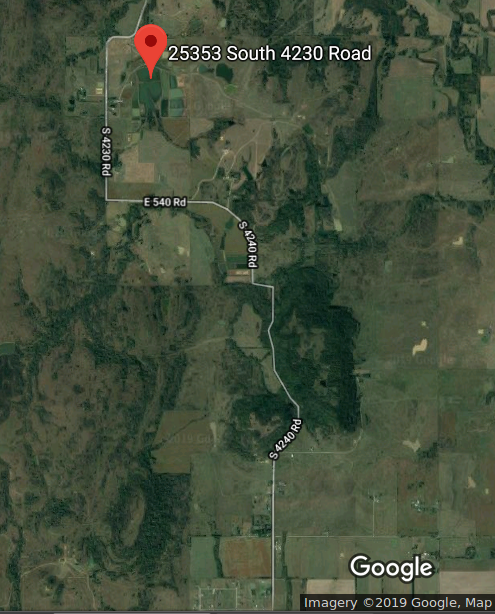 Study this Satellite View. This is a family operation, they own the entire area within this view. 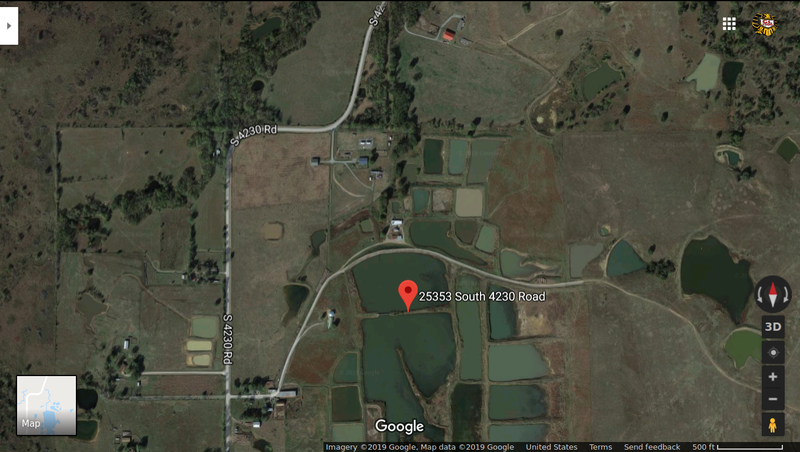 The original Street Address is the smaller farm house at the top of the screen where the road turns to the west and the driveway continues South in the middle of that turn. 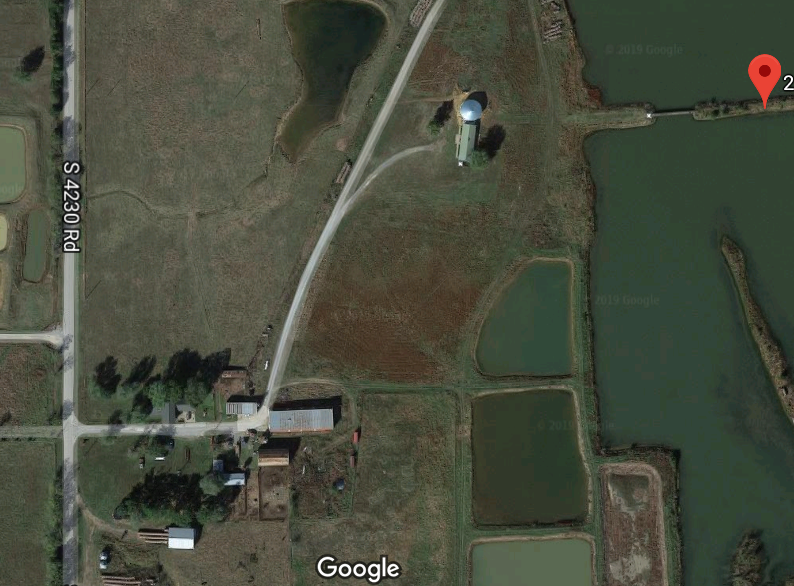 When you enter that driveway, you can see the Silver Silo in front of you, but the drive ends at the farm house. The Restaurant is to the left of the Big Red pinhead. Follow the drive past the Farm House through the pasture and go to the Silver Silo. Park anywhere you can find an open spot, it is all grass around the Fish Fry building. Approaching from the South driving North, this is what the road will look like. if you pass a farm house and suddenly see the Silo out in the open, you went to far. Doesn't look like I'll make it this weekend. last night my left knee went out on me so I'm icing it up today alternating with heat. Definitely not riding today, not sure about tomorrow, but will probably be good to ride in a few days. Have a good dinner with your daughter and we will get together sometime later.